NOTE: Hay Slough Fire information available from Echeverria’s IMT – below. Personnel: 320, including various support/logistics personnel; Four Type 1 (Hotshot) and six Type 2 crews and 1 Type 3 Tanana crew. Equipment: 8 boats, 1 watertender, 1 excavator, 1 dozer, a susv track vehicle, 2 dump trucks, ATV’s and other misc. equipment. extends from the Yukon upstream to the mouth of the Cosna River; a distance of over 35 miles. operation along the Tozitna River. especially in unburned pockets of black spruce. collected and sent back to fire camp to become available in other locations if necessary. showed a few pockets of fire activity within the interior of the fires. Today, the crews from the Bear Creek spike camp will be flown back out to work the western edge of Bear Creek in the areas of greatest concern with numerous hot spots. The smoke jumpers and hot shot crew members will continue mopping up after the burnout operations from yesterday’s structure protection operation up the Tozitna River. Patrols and rehabilitation of dozer and handlines will continue in the Site/Mission area. Several more brush piles will be removed and pumps and hose will be taken back to supply in Tanana. Patrols and collecting pumps and hoses will continue along the Yukon River. A persistent stationary thermal boundary will come into play again today. Weather will be cloudy with areas of smoke. Rain showers and isolated thunderstorms are likely. Maximum temperature will be around 67, minimum humidity 62%. Light winds are expected with gusty and erratic winds expected near thunderstorms. Tonight, mostly cloudy with areas of smoke are anticipated. Rain showers and isolated thunderstorms are likely throughout the night with scattered rain showers after midnight. Minimum temperature will be 52 degrees and maximum humidity 92-98%. West winds will be 5 mph in the evening becoming light. Gusty and erratic winds are expected near thunderstorms. Tomorrow will be partly sunny with areas of smoke in the morning, scattered rain showers, and a slight chance of thunderstorms through the day. Maximum temperature will be around 68 degrees and humidity 45-50%. Light winds are expected with gusty and erratic winds expected near thunderstorms. 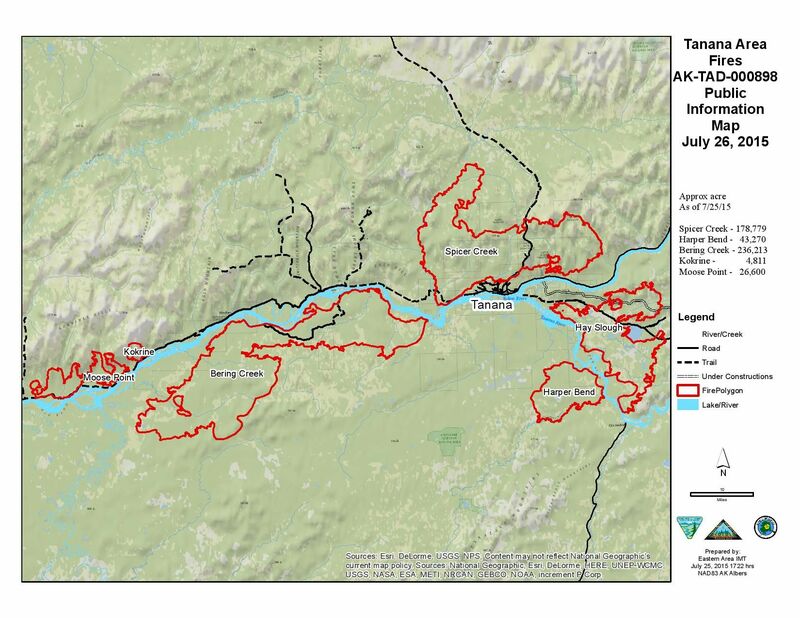 The next public meeting will be held Monday, July 27th at noon at the Tanana Community Hall to provide updated fire information. The public is advised to avoid traveling Site Road because of the danger of falling trees and heavy equipment use in the area. For more info: Please contact Information Officers, Bill Paxton or Kristen Miller, Tanana school ICP, at 907-987-9835 or TananaAreaFires2015@gmail.com. Inciweb (http://inciweb.nwcg.gov) also provides fire information. From the Inciweb homepage, select “Tanana Area Fires” fires from the drop down list at the top right of the page. The AICC Information Center at 907-356-5511 or https://akfireinfo.com/. Will Alaska’s fire season make it to the 5-million-acre mark?